Flight Night for Only $11! 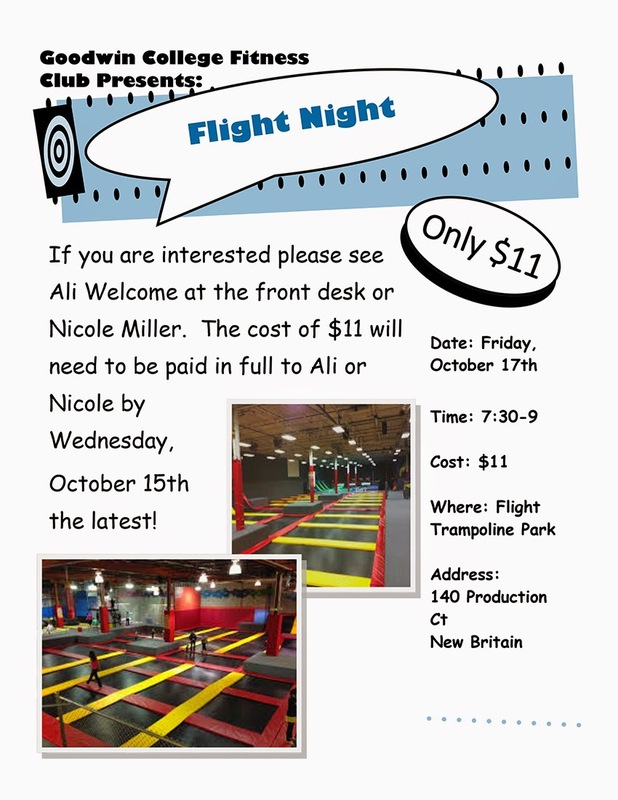 The Fitness Club will sponsor a “Flight Night” at Flight Trampoline Park, 140 Production Court in New Britain on Friday, October 17, from 7:30 to 9 p.m. The cost is $11 and must be paid in full to Ali Welcome (front desk) or Nicole Miller (Room 132) by October 15. 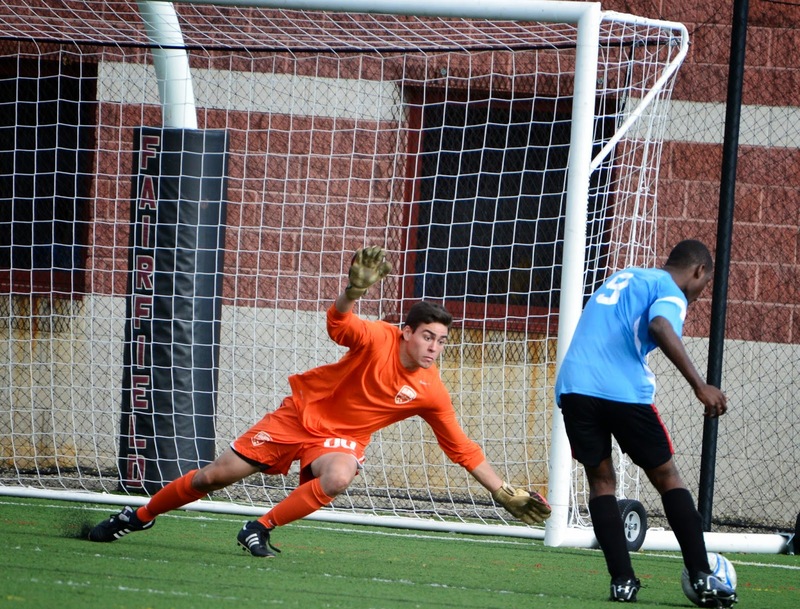 Seats are available to make the trip with the Navs Soccer Team to this Sunday's game (October 5th) at the United States Military Academy at West Point, as we play Army. The ride and the tickets are free, and the bus will be filled on a first-come, first served basis. The bus will leave Goodwin at 9:00 AM sharp, and return around 6:00 PM. Contact sports@goodwin.edu to be added to the list. School closings due to inclement weather: announcements will be posted on the following stations no later than 7 a.m. for day classes and 3 p.m. for evening classes: WRCH (100.5 FM), WTIC (96.5 FM),WTIC (1080 AM), WZMX (93.7 FM), WFSB-TV (Channel 3), WVIT-TV (Channel 30), WTNH-TV (Channel 8), andWTIC-TVFox CT (Channel 61). Students may also access school closing information by checking the homepage of the College website or by calling 860-528-4111. See school closing information in the College catalog (consider bookmarking this link). Please note: we do not use the emergency notification system for weather closings. Looking for a part-time job while in college? Check out the available positions below! The CT Department of Energy and Environmental Protection will offer free Resource Conservation and Recovery Act generator training in the Goodwin College Community Room on Thursday, October 16, from 1 to 4 p.m. No registration required. Those who provide their email address at the event will receive an electronic certificate. Open to all Goodwin students and employees. You can also register for the online webcast by emailing Mark.Latham@ct.gov. For more information, contact Bruce Morton at bmorton@goodwin.edu. National Medical Assisting Week, October 20 to 24, is sponsored by the American Association of Medical Assistants to recognize the importance of Medical Assistants in the health care field. In honor of National Medical Assisting Week, Goodwin’s Medical Assisting department will host a small gathering in the Community Room on Monday, October 20, from 3 to 5 p.m. for current Medical Assisting students and faculty. Cake, coffee, activities, and the chance to social and celebrate the great work that goes on in our Medical assisting program! Make plans to join us for this event. Please contact Amanda Lavigne at alavigne@goodwin.edu with questions. Email hrinquiries@cmhacc.org to confirm your attendance. Visit www.cmhacc.org for a list of open positions and apply now! Goodwin College Bookstore is excited to extend a special Six Flags Fright Fest offer to all Goodwin students, faculty, and staff. A reduced Scare Fare Package of $41.40 (plus tax) includes admission to all four premium Halloween scare zones, parking, and catered lunch from 1:30-2:30. 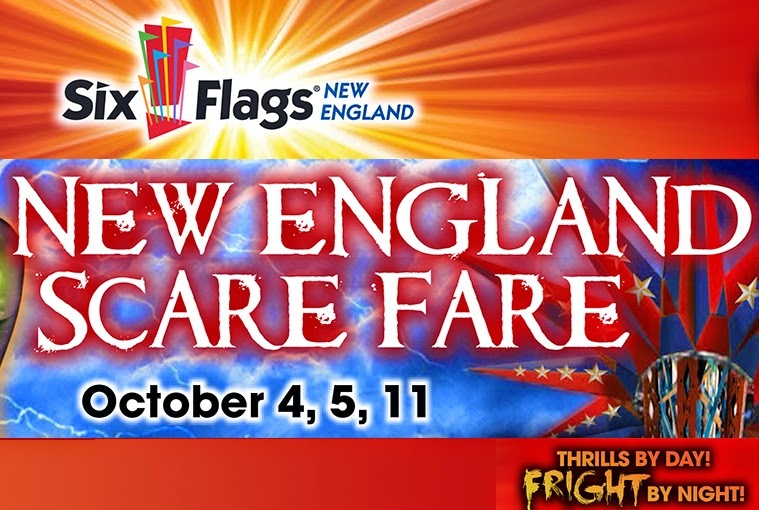 The offer is valid October 4, 5, and 11 only with promo code “Scare8” Click here to redeem this offer. Please contact Michael Ramsey or Deanna Fell at 860-727-6721 for additional information. or here for intramural Volleyball. Then you can download the Rec*It app for your phone or tablet, which will keep you up to date on all the happenings. Here's the link to download that app. Contact sports@goodwin.edu for more info! NU Hartford Marathon is Looking for Volunteers! NU Hartford Marathon is looking for 40 volunteers from Goodwin College. All volunteers will receive a jacket, water bottle, draw string bag and food. If you plan on bringing another volunteer, please have them sign up as a Goodwin volunteer. The deadline to register is October 1, 2014. For more information, please contact Jess Hallet at jess@hartfordmarathon.com. Join Environmental Studies Program Director Bruce Morton and other students for the 18th Annual Source to Sea Cleanup, a coordinated effort for cleaner rivers, on Saturday, September 27, 2014 at 8:45 am. If you are interested, you will meet the group at 8:45 am at Hockanum Elementary School located at 191 Main St. East Hartford, CT 06118. The rear parking lot is located on High St. The group will then set off to clean Keeney Cove and South Meadows, both located on the Connecticut River. Spend the day outdoors for a good cause! For more information on the 18th Annual Source to Sea Cleanup, please visit www.ctriver.org. If you are interested in attending, please contact Bruce Morton at bmorton@goodwin.edu. Please join the Goodwin College community as we gather to hear U.S. Congressman James E. Clyburn discuss his new book, Blessed Experiences: Genuinely Southern, Proudly Black, a compelling memoir of a civil rights leader's journey from the Jim Crow-era South to the Washington beltway. Please plan to attend this unique opportunity to meet one of the country’s most well-respected voices on equality and government. Goodwin College has received an update from Town Hall on Riverside Drive project. 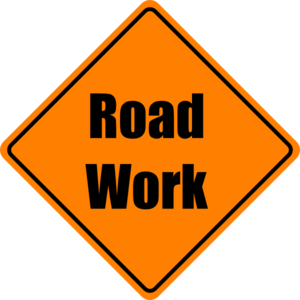 Work on the curbing is scheduled to begin on Thursday, September 18, so expect to see more equipment and increased potential for delays. Please plan accordingly. Thank you for your cooperation. A clothing and book drive will be held on Sept. 20 and Oct. 18 from 9 a.m. to 1 p.m. in the parking lot of the Price Right Shopping Plaza, 983 New Britain Avenue in West Hartford. 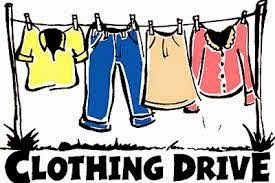 Needed: clothing, shoes, boots, coats, linens, comforters, jewelry, purses, small household goods, hardcover and paperback books, CDs, DVDs, audio books, textbooks. No furniture, appliances, magazines, newspapers, VHS or cassette tapes, catalogs, or encyclopedias. Proceeds to benefit CT Alliance for Victims of Violence & Their Families, a non-profit organization. Information: www.CT-ALIVE.org. 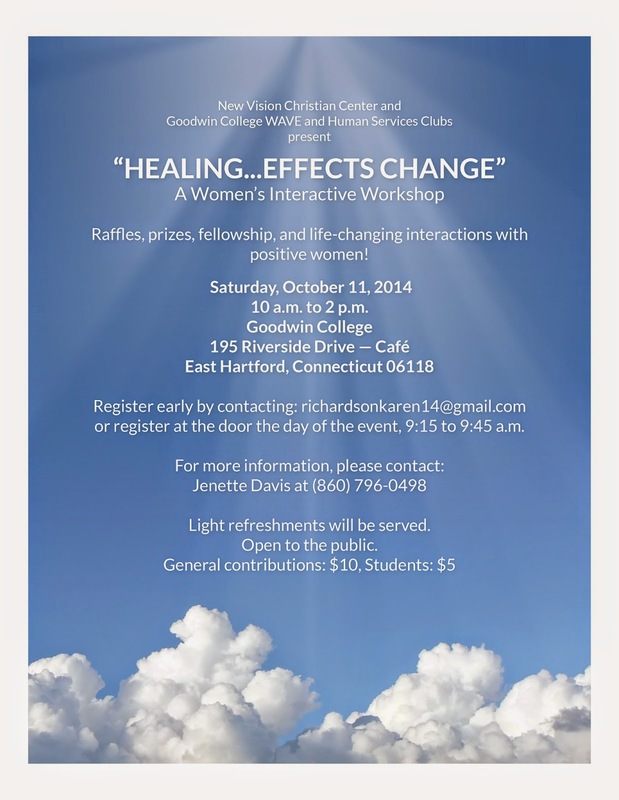 WAVE, the Human Services Club, and New Vision Christian Center present “Healing Effects… Change,” a women’s interactive workshop that focuses on life-changing interactions with positive women. Saturday, October 11, from 10 a.m. to 2 p.m. at Goodwin College. Register early by contacting richardsonkaren14@gmail.com or register at the door. Questions: Jenette Davis: 860-796–0498. Public: $10, students $5. 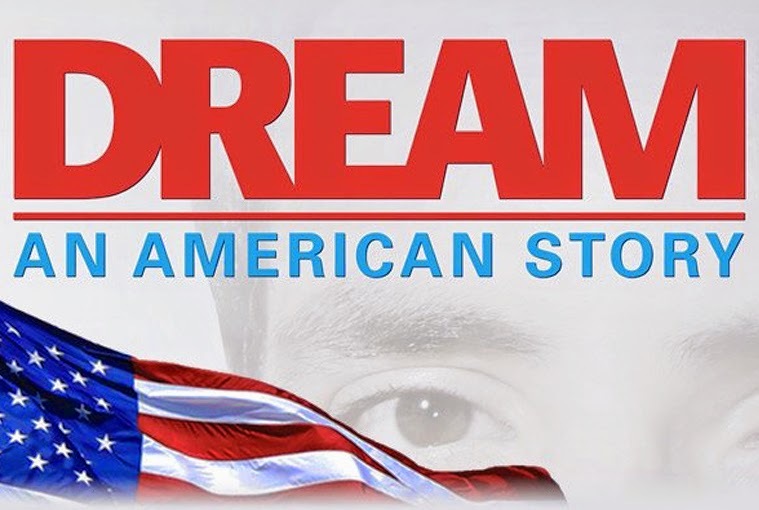 The Hoffman Family Library and the Library Advocacy Committee will show the film Dream: An American Story in the Auditorium on September 17, 18, 22, and 23 at 2:30 pm. Set against the backdrop of our nation’s heated immigration debate, Dream examines the dysfunctional U.S. immigration system through the story of Juan Gomez, a student under the threat of deportation. The film documents the rise of the national student and youth activist movement advocating the passage of the DREAM Act and the impact of immigration policy through interviews with students, politicians, immigration reform advocates, lawyers, ordinary citizens, and youth activists. Viewers will see the challenges that undocumented immigrants struggle with every day and gain an understanding of the strength and creativity they draw upon in their struggle for a better life. 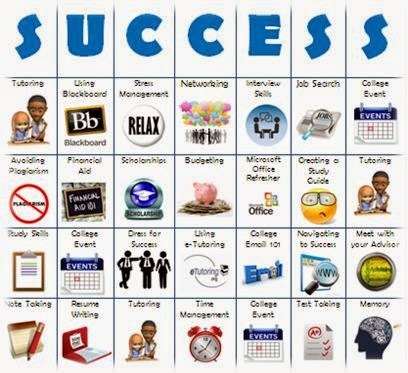 Looking for a great way to increase your chances for academic success? The Academic Success Workshops are designed to guide you as you navigate your way to success — focusing on developing your academic, personal, and professional goals. Workshops are free of charge to any Goodwin College student. Attend a session, play the “BINGO” game, win a prize! For a game board and full details on how to play, stop by the Academic Success Center, Room 209. Always check the Events Calendar for updates on times and locations or stop by the Academic Success Center or Math Lab. The National Day on Writing Conference, October 16, 2014, in the Community Room, is a daylong event from 9 a.m. to 5 p.m. that features writing workshops, a poetry slam, a poetry and essay contest award ceremony, live music by Howard Satinsky and Allan Ballinger, and a panel discussion. The theme of the day is Writing From Both Sides of the Brain. This year, our special guest speaker is Heidi McIndoo, MS, RD, LDN, author of The Complete Idiot’s Guide to 200-300-400 Calorie Meals and When to Eat What. She’s a nutrition writer, food and nutrition expert, and spokesperson. It is hosted by the General Education Department, the Library Advocacy Committee, the Poetry Club, the Writers Guild, and the Student Experience Committee. Make plans to join the contributors and staff of The Beacon, Goodwin College’s literary magazine, for a launch event on Tuesday, September 23, from 3 to 4 p.m., in the Hoffman Family Library. 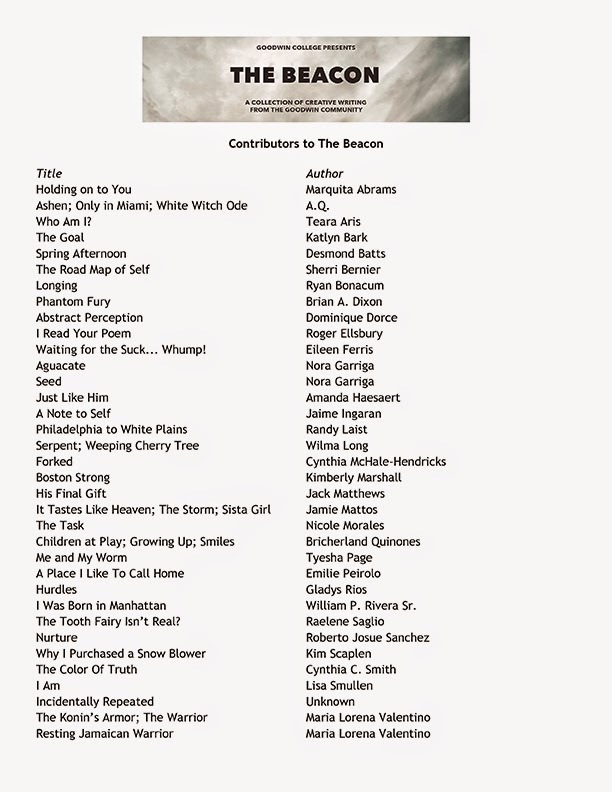 Writers will read selections of their work that were included in the new edition of The Beacon. Interested in a AAA membership? Take advantage of exclusive member benefits! Goodwin College has partnered with AAA to offer all alumni, students, and employees the safety, security, and savings of a AAA membership at a discounted rate. Join AAA as part of the Goodwin College group membership program and save money off of the membership price. Visit the Goodwin College lobby on Wednesday, September 10, from 10 a.m. to 5 p.m. and speak directly with a AAA representative. For more information, please contact Vanessa Pergolizzi at vpergolizzi@Goodwin.edu. 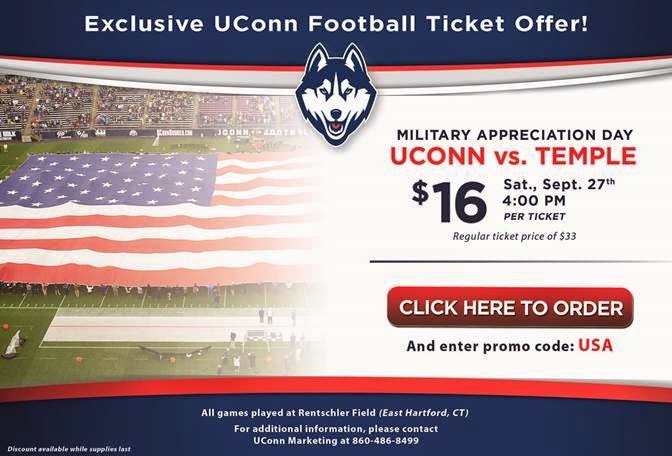 If you cannot make it to campus on September 10 but would like to purchase a membership, contact Steve Lasek at slasek@aaa-alliedgroup.com or 860-648-7329. Check out Goodwin College's Online Student Orientation! Videos and instructions to assist you in being more successful in your academic career. Available 24/7! Just click here to get to the site. If you have experienced the recent death of someone dear to you, join others in a supportive setting. Meet to share your stories, learn about grief, and discover how to support one another in a safe environment. The goal is to seek "The New Normal." The loved one will always be remembered AND it is possible to have joy again - over time. 1. Recommended audience is for people who have experienced a loss from 3 to 18 months ago. 2. The support group is open to the community. Feel free to share with others. 3. A commitment to attend all 4 class sessions is expected. 4. Registration is strongly encouraged by September 12. Requirement to speak with the facilitator directly. See contact information below. 5. Possible monthly "check-in" groups afterward. Linda Huff, Bereavement Coordinator at 860-290-6771 or lhuff@masonicare.org. 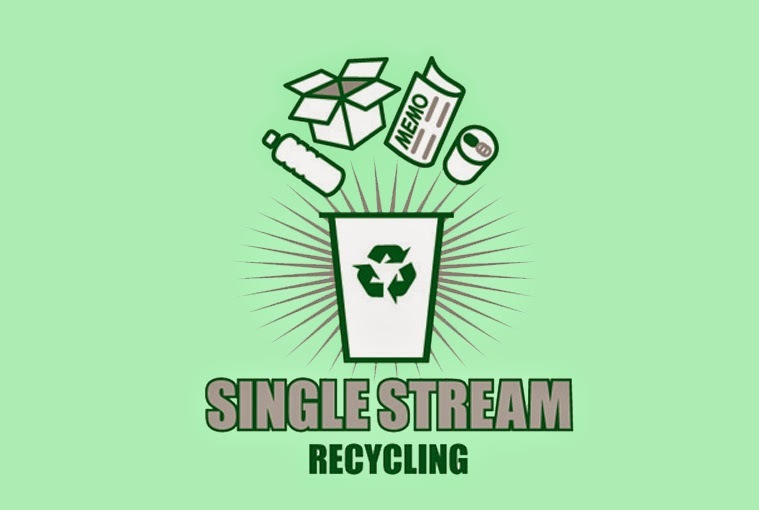 Please recycle using the blue-capped recycling bins in classrooms and offices at One Riverside Drive! These blue-capped bins can be used to recycle paper, bottles, cans, cardboard, paper bags, and much more. The Town of East Hartford and local utility companies are in the process of doing pre-construction work on Riverside Drive. This is in preparation for a larger construction project to redesign Riverside Drive from the Connecticut River Academy to the intersection of Ensign Street. Crews will be working on a varied schedule that is difficult to predict from day to day, so please plan on detours and accommodations for construction now through November. Your cooperation and patience will be greatly appreciated. Recognize anyone from the neighborhood? 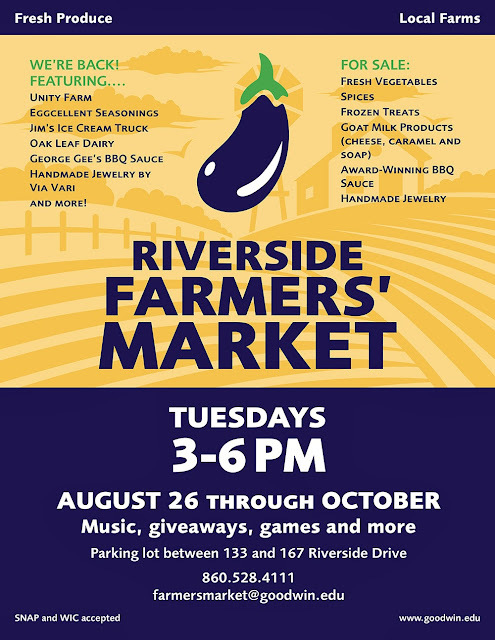 Click here to check out just who has been seen at the recent Farmers' Market!